Hanoi (VNA) - Vietnam’s agro-fishery-forestry exports in 2015 is likely to meet the set target of 30 billion USD as total exports in 11 months ending in November reached 27.41 billion USD, according to Ministry of Agriculture and Rural Development. Vietnam sees a year-on-year fall of 1.9 percent in agricultural exports in 11 months, compared to a decline of 3.8 percent for the ten-month period ending October. Exports of key farm products were estimated at 12.74 billion USD, down 4 percent from the same period last year. 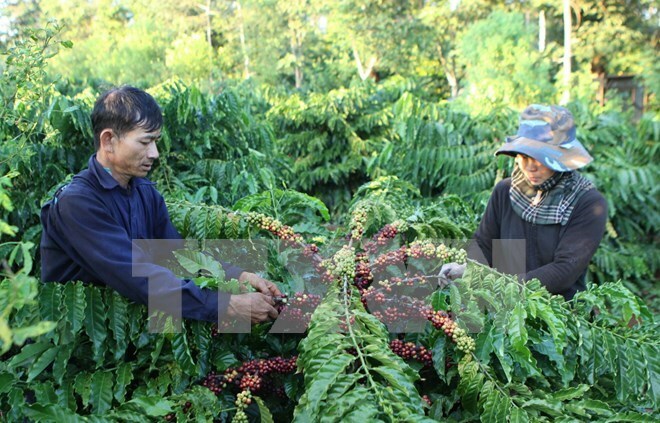 The sharpest fall was seen in coffee (30.2 percent) and rubber (15.5 percent). Rice export also posted a 4.9 percent in value despite a 3.6 percent increase in quantity. Meanwhile, upward trend was recorded in the export of pepper, cashew nut, cassava and cassava-based commodities with revenues rising from 2.9 to 19 percent. Significant falls of aquaculture product shipments to the US (over 25 percent), Japan (13 percent) and the Republic of Korea (14 percent) resulted in the decline of 16.4 percent in total aquaculture export value in the reviewed period, which was forecasted to stand at 6.01 billion USD. Meanwhile, the export turnover of key forestry products was valued at 6.4 billion USD, surging 8.2 percent from last year. In the coming time, the Ministry will organize more trade promotion activities abroad, aiming to sell dragon fruits to the Japanese market and chicken to Russia while expanding foothold in potential markets, especially developed countries.